Have you ever seen something that was just so darn cute that it brought tears to your eyes? 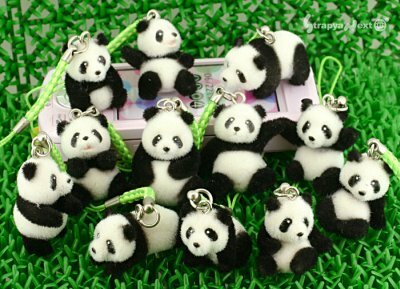 I know it was probably something legitimately touching and precious like a baby consoling a grandparent or a puppy curled up next to a kitten that had you reaching for the tissues, but for me, what pulls at my heart strings are these adorable, adorable, adorablepetite panda cell phone charms. Yes, you read that right. A photo of a dozen variously posed 1.18? to 1.57? panda bear charms makes my eyes well up. Whether it’s the fact that each one has a ring bolted into the top of its head so that it can dangle oh-so-callously from a cell phone, the powerlessness I feel in not being able to select which panda to save (Strapya World chooses one at random), or that the $3.11 handset accessories are currently sold out is to blame for the waterworks is something only my therapist can discover.